Too often, we meet clever children who love camp and extracurricular activities, but just don't feel the same way about school. You may be relieved to know that he or she may be suffering from a hidden vision issue that effects learning. It's known as Convergence Insufficiency (CI). In short, CI is a near vision issue that negatively affects one's capability to see, read, learn and work at close distances. Someone suffering from CI has a hard time, or is more or less unable to coordinate his/her eyes at close range, which impairs things like reading. In order to avoid double vision, schoolchildren try harder to make their eyes turn back in (converge). All this extra burden on the system can lead to an astounding amount of prohibitive symptoms including eyestrain, headaches, blurred vision, double vision, fatigue and decreased concentration, and the inability to comprehend during relatively brief reading periods. Subsequent issues include difficulty performing computer work, desk work, playing on handheld video games or doing crafts. With severe instances of CI, the eyes may actually turn outwards. This is what optometrists call strabismus. You might also notice that your child frequently loses the place in a book, tends to shut one eye to better see, struggles to remember what they just read, or describes how the words they look at appear to move, jump, swim or float. Another issue that often comes up is motion sickness. And if your child is sleepy or overworked, it's common for their symptoms to intensify. CI is usually misdiagnosed as dyslexia, ADD or ADHD or even an anxiety disorder. This eye problem is easily missed when a child gets a simple eye exam using only an eye chart. Your child may have 20/20 eyesight, but also have CI, and the resulting challenges when it comes to basic skills like reading. But it's important to know that CI usually responds positively to proper treatment. 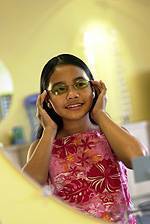 These treatments generally involve vision therapy performed by an eye care professional with reinforcing practice sessions at home, or the use of prism glasses, which can decrease some symptoms. Unfortunately, because of consistent lack of testing for it, many sufferers aren't finding the help they need early in life. So if your child shows signs of struggling with any of the issues mentioned above, speak to us and be sure to have your child tested for CI.